When choosing a home remodeler, most homeowners are thinking about the end result: a great design, extra space, better flow, new functionality and greater every-day pleasure and livability. At Merrill Contracting & Remodeling, that’s all you need to think about – because we’ll take care of all the details necessary to realizing your remodeling dreams. You can trust us to be a professional general contractor and to take a very personal interest in both quality and your satisfaction. Because of our time-tested system and the fact that communication is always in plain English, details from plans and permits to inspections, construction and even change orders goes smoothly. Plus, we’re a home remodeler that always has our Lead Carpenter on the site to manage everything and everyone. And every member of the Merrill home remodeler team is dedicated to delighting you not just with the final result, but with a relaxed, pleasurable and worry-free remodeling experience every step of the way. We think it’s this commitment that wins us such high marks on customer satisfaction, and such loyal clients who choose us as their builder over and over again. According to a survey published in 2012 homeowner satsifaction ratings for remodelers nationwide are only between 60% and 63% depending on being willing to recommend and being happy with the remodeler. …extraordinary service two years later… Merrill Contracting still concerns themselves with a project that was already completed — unheard of in this day and age. 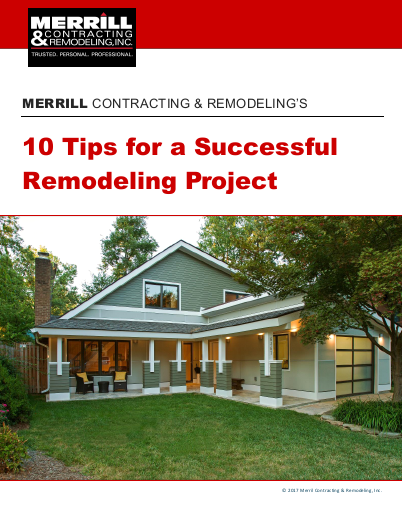 This type of service and support makes it all the more clear why Merrill Contracting should be anyone’s Contractor of choice for a home improvement project. Overall, we could not have had a better experience. Your firm does excellent work and has a genuine regard for the wishes and welfare of the people who engage you. Your carpenters did everything they could to please us and make the project go smoothly and painlessly. These men were courteous, did not use vile language or play radios in an obnoxious manner. You do a very good job recognizing and minimizing the additional stress of living through construction. You do so much to smooth out the bumps along the way, and we really appreciate your dependability, even temper and constant professionalism. What continues to impress me… is your low-key, nothing-is-a-bother, let’s-get-it-right attitude. The Lead Carpenter was always willing to explain the status of the project. He was patient with us and willing to listen to our ideas/suggestions and incorporate as many as possible, or explain why not. The Lead Carpenter was always accommodating, professional and committed to excellence. It was a much less disruptive experience than we anticipated. You and your subs were helpful and very easy to work with. Job well done! The project could not have been any easier. The Lead Carpenters were outstanding. The communication between them and Dave Merrill was very good. The Lead Carpenter and Production Manager were great. My husband and I highly recommend [Merrill’s] work, his character and his integrity. …we have used many contractors in our various projects. We have never worked with a contractor who was as professional, responsive and interested in producing a quality project in a timely manner. We found your company to be highly professional in every aspect, from the first meeting to final walk-through. …the quality of work and the attention to detail is really impressive. We… commend you on the integrity, conscientiousness, reliability and kindness of your outstanding crew. Every subcontractor, supplier and inspector we’ve spoken with have been highly complimentary of your team. …very impressed with the Production Manager… he did a fabulous job of keeping us informed. The exterior design is fantastic.